What are the benefits of partnering with Age UK Sunderland? A partnership with us could be beneficial for your business by helping you meet your corporate social responsibility objectives. It's a great way to motivate employees, gain insight into the over-50s market, get some great PR and help Age UK Sunderland to support vulnerable people in the local community. Contact us on enquiries@ageuksunderland.org.uk for more information. Please consider choosing Age UK Sunderland as your business Charity of the Year. In return we would offer joint branding on our fundraising materials and our events, as well as positive PR and local media coverage. Your staff could get involved in our events thoughout the year, such as one of many projects or even our volunteer's party. By sponsoring an event you help us with the costs, for example, food and decorations, and in return get some great PR and local media coverage. Could you display a collection tin in your office or shop? This would help us to collect much needed donations to ontinue our vital work in Sunderland. Could you send a team to help out at an event or activity? It's a great way for staff to bond by working together to help vulnerable older people. Previous staff teams have served Christmas lunches and taken older people on days out. 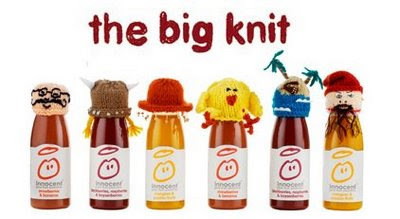 Age UK and innocent first launched The Big Knit in 2003 and it has continued every year since providing promotion and funding. The hats are knitted exclusively by volunteers who give up their time and wool to make them. Thank you to everyone who knitted a hat for this year's Big Knit. From October, you'll start to see your little hats sitting on innocent smoothie bottles in stores across the UK. For every behatted smoothie that is sold, Age UK will receive 25p to help keep older people warm and well. A big thank you to Innocent smoothies for all their help and support.